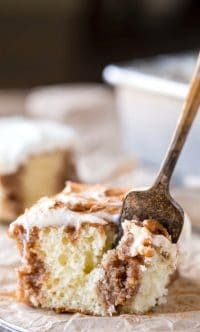 Cinnamon roll bites are homemade pull-apart bread bites covered with gooey, buttery cinnamon roll filling and rich icing. 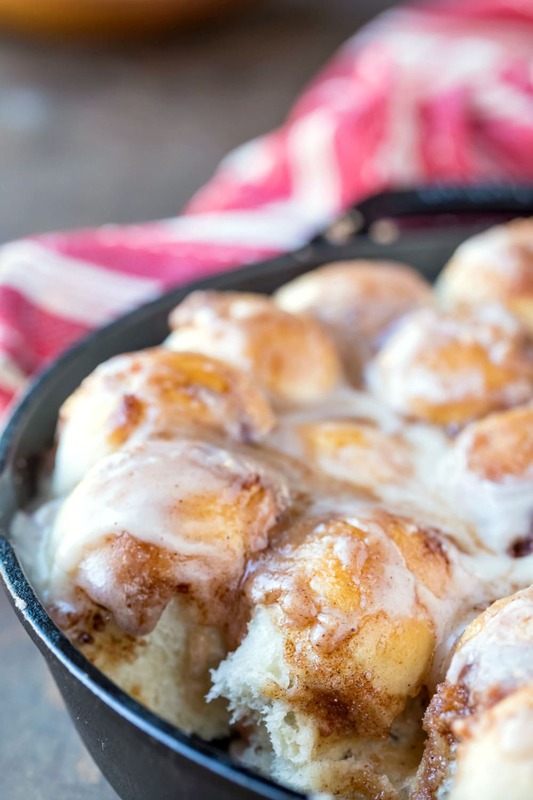 Quick cinnamon rolls that are homemade in one hour! Cinnamon rolls are a favorite treat at my house. 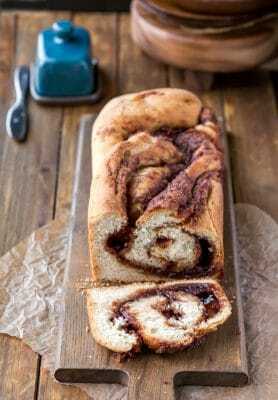 Since we love all things cinnamon roll, I have a number of cinnamon roll recipes. 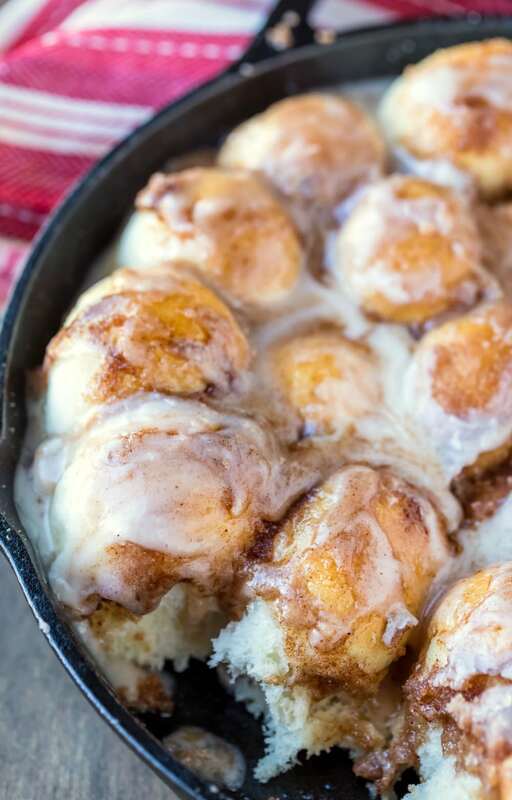 These cinnamon roll bites are little different, though. 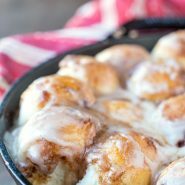 They are more like the gooey middle of a cinnamon roll than a traditional roll. 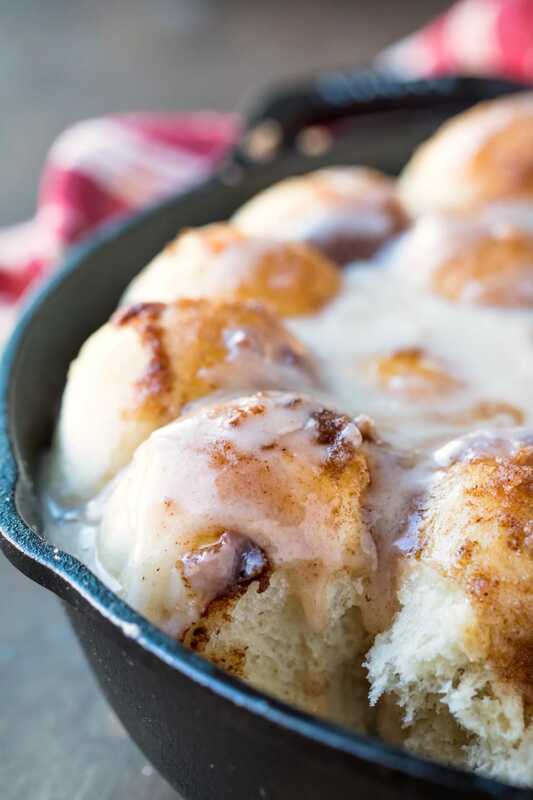 The cinnamon roll bites are topped off with a healthy dose of sweet icing. The little bit of butter in the icing gives the icing a yummy richness that makes it extra tasty. 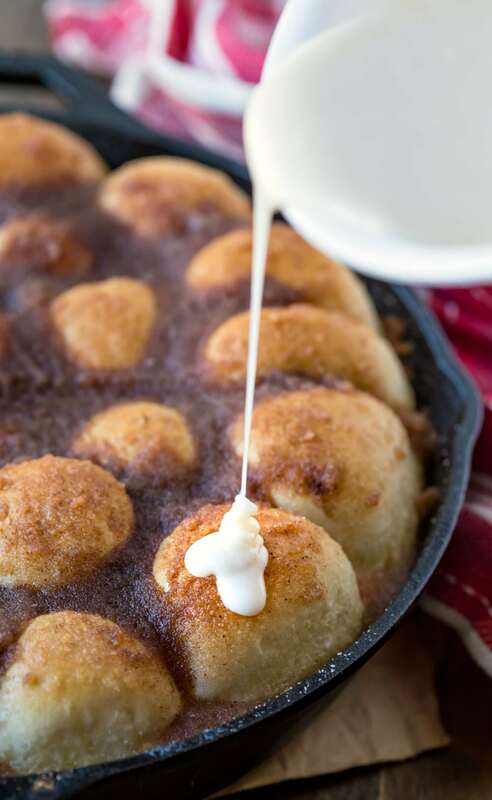 And these cinnamon roll bites are ready in just one hour, so they’re great for times when you want a cinnamon roll but don’t want to spend all day baking up a batch. In the bowl of a stand mixer (or in a large bowl), stir together the warm water, yeast, and sugar. Let stand for 5-10 minutes or until foamy. Mix in flour and salt until dough clears the sides of the bowl. Knead dough for three minutes. Grease a 10-inch cast iron skillet with butter. 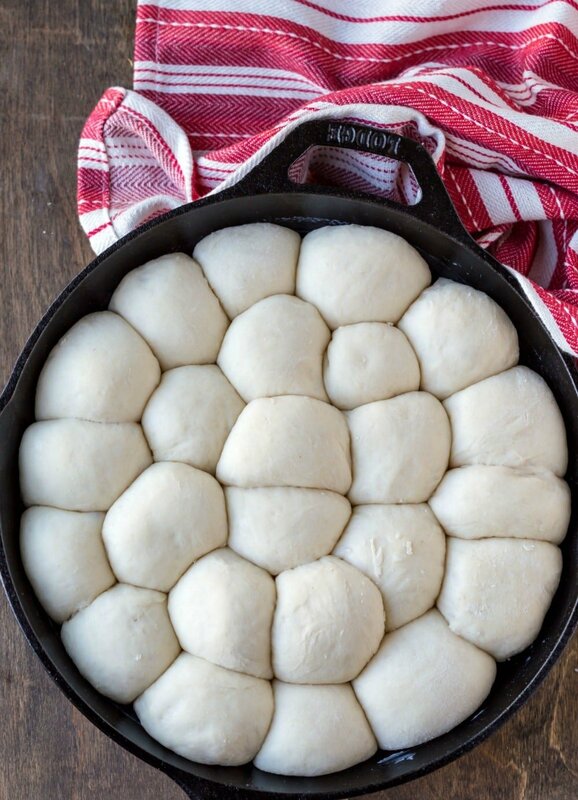 Shape each piece into a ball, and place dough balls in the prepared skillet. Cover with greased plastic wrap, and let rise 20 minutes. Uncover, and bake 15-20 minutes or until golden brown. While bites are baking, stir together granulated sugar and ground cinnamon. Brush bites with half melted butter. Drizzle remaining half butter over bites. To make the icing, stir together melted butter, powdered sugar, and vanilla. Add 1 tablespoon milk, and stir in. Continue adding milk until icing reaches desired consistency. I use about 1 1/2-2 tablespoons for a thicker icing. One more quick question. If I want to bake half a batch, can I freeze the other half of dough to bake another time? So the bites don’t bake anymore after you put the butter and cinnamon sugar mixture on them? 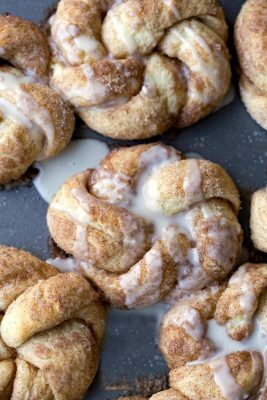 Just wanted to clarify as hubby has been craving cinnamon rolls and I love that these are quick and make a smaller batch than other recipes I have seen/tried. I don’t have a cast iron skillet would a regular cake pan work? I haven’t tried this recipe in a cake pan, but I would think that a cake pan would work. Good luck!